Kapur & Associates was responsible for Right of Way Plat development, LiDAR mapping, and topographic survey for the project. All in all, 633 parcels are adjacent to this 11.5 mile project, with much of the land being zoned either institutional or commercial. 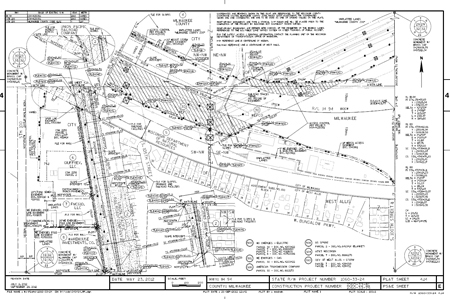 Many parcels have a uniqueness that doesn’t fit an ideal real estate scenario and many of the parcels are affected by more than one of the project plats. Several parcels shapes were defined by up to 7 independent “last deeds”. In several cases the land and the buildings are owned by different entities and streets mapped and used by the public have no right of way established, but travel is permitted. To date, there are 28 independent utilities reflected on the right of way plats. Utility relocation schedules have also dictated Relocation Order dates. Real estate interests for the 4 currents plats have generated 21 Relocation Orders as of January, 2013.